The Canadian lynx is a 20-pound big cat, native to North America. At one time, they ranged freely from the frozen wilds of Alaska, all the way down into the Northern United States. With few natural predators, these animals were once found in abundance all over this snowy domain, but after being targeted for their fur in the 19th century and falling victim to deforestation in the 20th century, these days, Lynx have found themselves on the endangered species list. Cleo is a Canadian Lynx who was adopted by a human family as a kitten and forced to live as a pet. Instead of feeling the cool wind in her fur and the snow under her feet, poor Cleo was declawed and forced to live her entire life indoors. Wild animals are not the same as domestic animals and, for this reason, they often make challenging pets. So when Cleo’s family split up, her papa did the right thing and found a home for her at The Wildcat Sanctuary. The Wildcat Sanctuary is a non-profit located in Minnesota, that provides a lifelong home for abused, neglected and discarded big cats. Here they are given a second chance at life and a small taste of the freedoms that they have been denied. 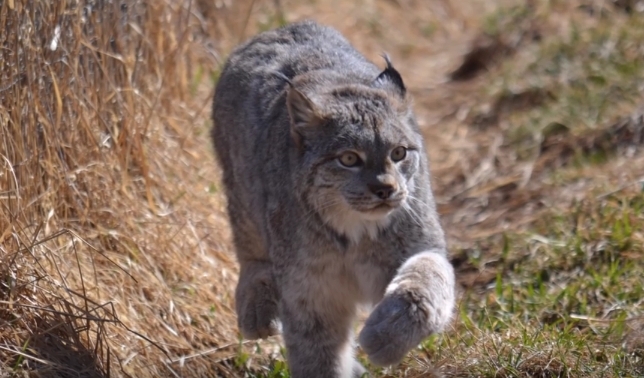 If you would like to learn more about The Wildcat Sanctuary, you can visit their website here. Responses to "Rescued Wild Lynx Steps Outside For The First Time In 13 Years "
I don't ever condone keeping wild animals as pets, and declawing is a horrible thing, but why must this post paint the prior owners as monsters? Did they abuse her? Was she unhappy? If the worst thing they did to her was keep her inside, they may have been misguided, but you don't know that they didn't love her and that she didn't love them. Can't you tell her story without the judgmentalism? Tracy -declawing is abuse. Keeping a wild animal captive IS abuse. A wild animal meant to feee amongst the trees and snow and wilderness never touching grass or feeling sun on their fur? Its a pretty certainty that YES she was unhappy. "Loving" does not mean what they did was not abuse. Trying to make a wild animal a pet -and declawing, or defanging, etc., is done from selfishness. Because WE want, not what is in the best interest of the animal. So yes, there is judgment.